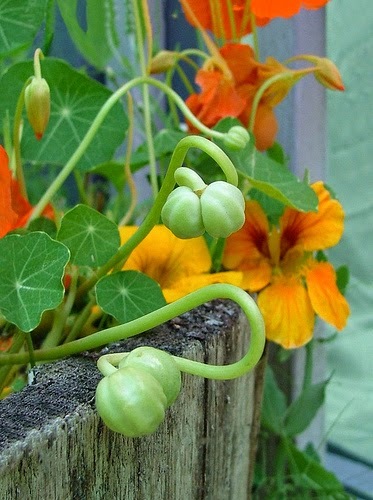 If you've ever planted nasturtium seeds once, you know you'll never be without them again. They are the most prolific reseeders of the garden and happily grow up and around every flower and veggie in your garden. The best part is, the entire plant is edible! The petals are light and peppery and perfect for the summer salad, the leaves make a great pesto, plus they just are darn pretty in a vase. My new favorite summer appetizer is so simple and beautiful, I'm certain your guests will happily devour them. salt, pepper and a tablespoon or two of fresh snipped herbs. I used chives. Mix the last 3 ingredients and stuff each blossom with a scant teaspoon. These are best made right before you plan on serving. I read you can even pickle the seed pod. Trying that this summer! Linked to Make it Pretty Monday.